The Sludgelord: Boudain - "Way of the Hoof" (Album Review) & Exclusive Stream of "Disco Jimmy"
Boudain - "Way of the Hoof" (Album Review) & Exclusive Stream of "Disco Jimmy"
Heavy Blues bolstered with some low tuning and fuzzed up crunch allow Boudain to cruise through their new album, “Way of the Hoof”, like the biggest gator in the bayou. Hailing from the mighty swamp areas of the American South, Boudain plays it slow, muddy, and gritty, much like the very tasty dish they are named after. Heavy Blues bolstered with some low tuning and fuzzed up crunch allow Boudain to cruise through their new album, “Way of the Hoof”, like the biggest gator in the bayou. Sounding like a muddier Wo Fat, Boudain come out swinging with “Sleazy Feats”; being true to the title, its a down and dirty fight with their tunes coming fast and riffy. The album flows well from then on, with some songs occasionally being a bit muffled and lacking just a tinge of the high end I really want (“CODA”, little bit on “Neptune”). However, it's a very small complaint against a fun album, especially to those that love the more bluesy offerings of the fuzz genres. Boudain comes calling with conviction, with some exceptional chops on several cuts, the aforementioned “Neptune” definitely balancing its mud with some really catchy playing and general fret wizardry. They don't slow down all that often, preferring to keep the pace moving to keep it from stalling. “First Class” keeps the midsection of “Way...” rolling quickly and smoothly, keeping the beat on point with a simple and quick rhythm section. From there they move around between keeping it in the rhythm lane and simply pouring hot lead on their fingers and shaking it onto paper with their licks (“Disco Jimmy”), before they drop the guillotine with a sweet, loose, gritty cover of “Godzilla” by Blue Oyster Cult. 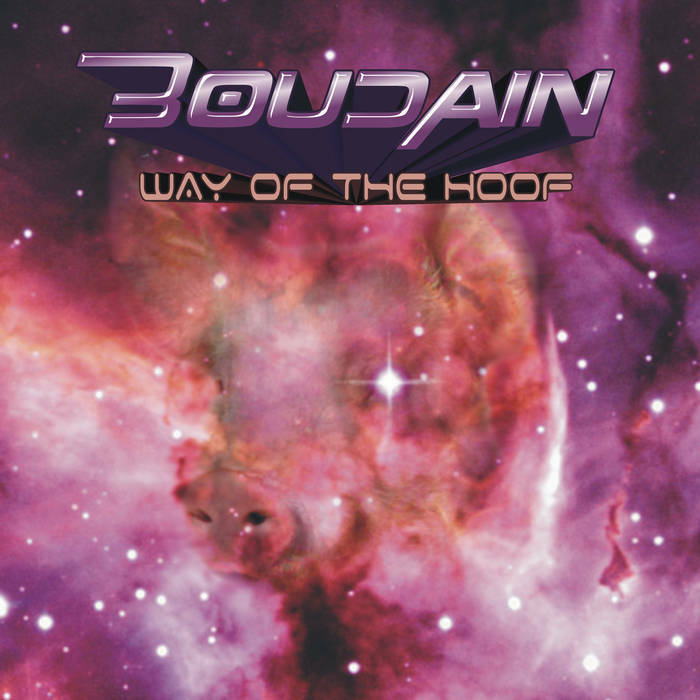 “Way of the Hoof” is a welcome enterprise from these fuzz fondlers, and Boudain should be a fun intro to anyone wanting that old soulful experience from their bands, but those wanting something new or to have it open their eyes, they may be a little disappointed. Just have fun with it, and you'll get everything you need.